Skin Rejuvenation 101 is a two-day comprehensive course covering the latest technologies in aesthetic medicine and cosmetic surgery with certification for Microdermabrasion, Microneedling, Radio Frequency, IPL, and Lasers conducted by experienced clinical instructors. This course is intended for practitioners with minimal to no previous experience performing technological modalities in the field of aesthetic medicine and cosmetic surgery that are looking to acquire the proper knowledge, skills and certification from a nationally accredited association. In this comprehensive hands-on training course, each attendee will have the opportunity to conduct patient consultations, formulate treatment plans and perform treatments on real patients. AAAMS and Viora offer the support, resources and consent forms to help you get started! 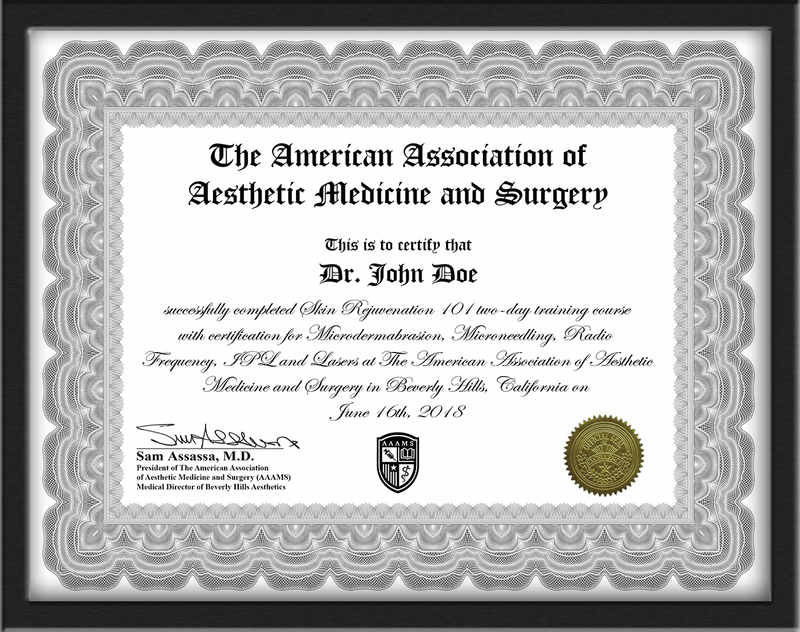 Upon registration, attendees will be granted access to the online learning management system and enrolled in Skin Rejuvenation 101 Online Program by The American Association of Aesthetic Medicine and Surgery (AAAMS) and Viora. This online program is a comprehensive series of online videos designed to provide participants with a robust foundation for understanding technological modalities in aesthetics. The online program includes over 5-hours of training video lectures and video demonstrations covering Microdermabrasion, Microneedling, Radio Frequency, IPL, and Lasers. This comprehensive online program serves as a prerequisite didactic session for the hands-on training course and are designed to provide a comprehensive understanding on both a fundamental and an advanced level. The online aesthetics course includes a required assignment at the conclusion that will measure the attendee’s level of understanding and test his or her knowledge. The online aesthetics course not only helps prepare attendees for the hands-on session but it maximizes on the whole approach to aesthetics. This in-person hands-on training session is designed to build confidence in using the technological modalities, develop technique under supervision, and test your skills on real patients. Upon completion of this session, attendees obtain confidence, and the proper skills to administer these modalities on the very next day. To qualify for hands-on with real patients, you must show valid proof of medical licensure prior to the course.